An administrative screw-up could keep thousands of low-income Americans from buying healthy food with SNAP benefits. Is The Produce At The Farmers Market Local? Turns Out, Not Always. 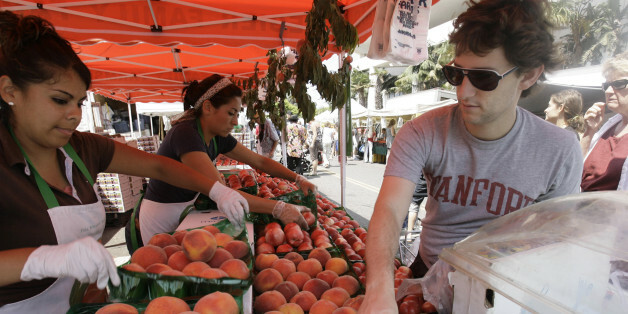 States have different rules for what can be sold at farmers markets, and some states have no rules at all. Amazon has taken over Whole Foods and is already lowering prices. So how will local grocery stores compete? Each week, I stroll through the market scavenging for the best produce for our menu. I covet these summer months when the market is brimming with rows of golden cherry tomatoes, giant squashes, and ripe peaches. These open-air markets bring me back to Tuscany--especially when I see rows of bright sunflowers, or girasoli. To capitalize on these last summer days, I'm using this post to point out some of my favorite seasonal produce, and a few tips on how to navigate the market like a chef. I found an easy way to cut out the middleman and go straight to the source. Some of my earliest (and happiest) memories of childhood are associated with the huge vegetable garden that sprawled at the back of our property. Breathtaking seems the best adjective for the 308-acre Dix property Raleigh recently acquired from the state of North Carolina for $52 million. The only aspect more breathtaking than its size, scope and beauty is how far-reaching a challenge this rolling, wooded landscape presents the city. "The more you can be truly outside and run around under the sun, the happier you are." Trudy loves taking the drive every Friday morning, starting early at 3:30 a.m. as she leaves the house, and described the experience almost as a meditation, sharing a nostalgically personal moment. Roasted vegetables are actually a very satisfying meal all on their own. I know some of you may be saying "meh, I'd rather have a burger," but when seasonal vegetables are roasted just right, they can truly be satiating. Are We Eating Our Veggies Yet? The movement away from big retailers towards local entrepreneurs is a good one. It benefits the consumer because as the market grows, the consumer has more choices--to buy locally grown food, handmade products, or artisanal work once very difficult to find. As the founder of an eco-friendly cleaning company, I can't help but use some of those glorious farmers market finds to create effective (and economical) DIY cleaning solutions. Here are 5 farmers market products that are cleaning powerhouses.